The three featured fighters from the famed ALA Gym who will clash with three tough Latino opponents are training harder than ever for “Pinoy Pride 27” at the International Trade Center in Dubai on September 5. The fight card in the highly successful partnership between ALA Promotions and the giant broadcast network ABS-CBN will be staged in cooperation with The Filipino Channel TFC which has a huge following especially in the Middle East. Undefeated WBO Intercontinental super bantamweight champion Genesis “Azukal” Servania, charismatic junior lightweight Rey “Boom Boom” Bautista who is on the comeback trail and unbeaten King Arthur Villanueva trained at the newly opened ALA Boxing and Fitness Gym on Balete Drive, Quezon City before returning to Cebu for their final month of preparation knowing that they will have a fight on their hands in Dubai. In the main event promising Genesis “Azukal” Servania who has a record of 24-0 with 10 knockouts will defend his title against tough 27 year old Jose “Matador” Cabrera of Mexico who has a record of 22-4-2 with 10 knockouts and has fought some of the big names including WBO super flyweight champion Omar Andres Narvaez and former WBC super flyweight champion Tomas Rojas. Bautista who was mobbed by Filipino fans the last time he fought in Dubai will clash with strong and resilient Mexican Juan Jose “Piquet” Martinez, the reigning WBC Mundo Hispano champion with an awesome record of 15 knockouts in 19 wins with only one defeat. 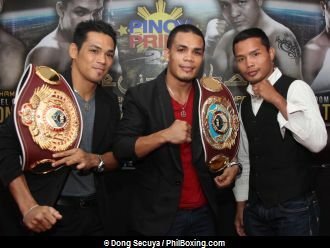 Martinez won the title by a unanimous twelve round decision in a thrilling ring battle with Carlos Jimenez last March 29. Mexican media reported that Martínez conquered the Hispanic title with a thrilling win over Carlos “Torito” Jimenez. The reports said Martinez was floored hard in the first round, but bravely recovered and achieved payback, sending his rival to the canvas in the seventh round. After having survived the knockdown, Carlos Jimenez came from behind to have a great closing round that brought the fans to their feet and it looked like Martinez was going to lose by KO, but he thrillingly dug deep to exchange a hailstorm of punches and win the round. At the end with the fans in a state of high drama and great excitement, Martinez was announced as the winner by scorecards of 114-113, 115-111 and 115-111. In another fight that promises to be a fierce battle, undefeated “King Arthur” Villanueva will take on Nicaragua’s Henry “El Crespo” Maldonado who is coming off an impressive 5th round knockout of Bayardo Ramos to win the vacant WBO Fedebol super flyweight title last February 28. The 26 year old Maldonado has a record of 18-3 with 13 knockouts while the 25 year old Villanueva had a record of 25-0 with 14 knockouts and is coming off a ten round unanimous decision win over Fernando Aguilar last March 1, 2014 after scoring a spectacular 1st round knockout over Edgar Martinez to win the vacant WBO International super flyweight title on October 26, 2013.